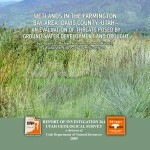 This CD contains a 36-page report of an evaluation by the Utah Geological Survey of threats to the Farmington Bay area wetlands posed by changes in climatic conditions and by increased ground-water withdrawals accompanying population growth. To evaluate the potential impacts of drought and increased development on the wetlands, we used existing data to estimate a water budget for the wetlands area. To determine the potential impacts posed by increased ground-water development and further drought, we used two regional, three-dimensional, steady-state and transient MODFLOW models for the east shore area of Great Salt Lake to evaluate water-budget changes for the wetland areas. The modeling suggests that subsurface inflow into the wetland areas would be most affected by decreased subsurface inflow due to long-term (20-year) drought conditions, but subsurface inflow would also decrease due to increased municipal and industrial well withdrawals over the same time period. Therefore, the worst-case scenario for the wetlands would be a combination of both conditions.